Taking cues from the LG G2? There's little doubt LG is building the Nexus 5, and today we have yet more evidence that the phone is inches away from taking the stage. 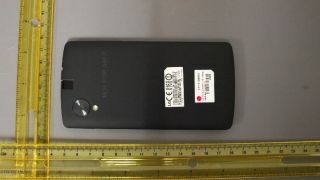 Thanks to an FCC filling spied by Phone Scoop, we have our clearest look yet at what is likely the next Nexus phone. The model number for this handset is D820, matching another FCC filing we reported on last week. Today's shots, the first D820 images and a phone flaunted in a commercial for Android KitKat all appear to match, indicating that this phone, whether the Nexus 5 or other, is real and increasingly less camera shy. We should note the new FCC images don't have "Nexus" stamped on the back like the device spotted in Google's Android 4.4 ad, but cosmetic differences aside, the large camera and flash orientation are as close as kin. Couldn't get a sharper shot, could you FCC? The filing picked up by Phone Scoop is for a "class 2 permissive change" for Verizon's version of the LG G2. LG may base the new Nexus on the G2 - the Nexus 4 stemmed from the Optimus G, so the pattern could continue with the Nexus 5. Rumored specs for the Nexus 5 include Bluetooth 4.0, NFC, dual-band 802.11 b/g/n/ac and 7-band LTE support. We could see two variants of the phone, one supported by AT&T, Sprint and T-Mobile and one by Verizon, but for now we have nothing more than filings and inadvertent (?) guest appearances to go by. Read our hands on reviews of the iPhone 5S and iPhone 5C before both phones go on sale.